Staples’ John McNab swims to a second-place finish in the 200 freestyle during the FCIAC championships Feb. 28. 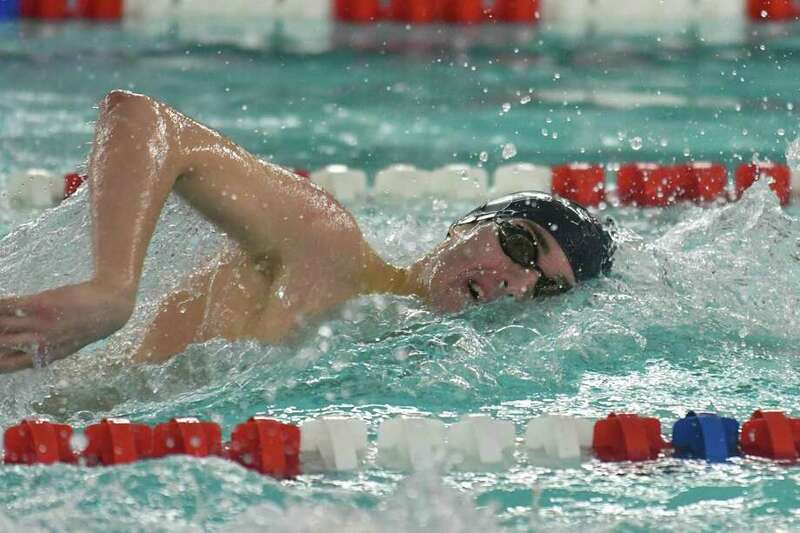 WESTPORT — The Staples boys swimming and diving team is looking to cap its season in fine fashion. The Wreckers are coming off back-to-back fifth-place finishes at the FCIAC and CIAC Class LL state meets and are looking for a few more individual top finishes at the State Open, which took place on Thursday at Yale’s Kiphuth Pool. “We’re bringing four or five swimmers, three in individual events and two relays, so I think each one has a chance to tweak up their performances,” Staples coach Todd Gordon said of his team’s outlook for the State Open. Staples was fifth at the Class LL meet on Monday at SCSU with 337 points, among six FCIAC schools in the top 11, with Greenwich taking the team title with 911 points. The Wreckers had several fine performances at the state competition, including senior John McNab, who was third in the 200-yard freestyle (1:42.26) and second in the 100 freestyle (46.91), senior Austin Twiss, who was second in the 100 backstroke (52.59) and 12th in the 100 butterfly (53.65), senior Justin Lovro, who was 13th in the 200 IM (2:01.94) and 11th in the 100 fly (53.16) and junior Nick Lott, who was 10th in the 500 free (4:55.14) and 13th in the 100 back (56.66). Those four also were a part of the 400 freestyle relay which placed sixth overall (3:16.50). Twiss, who will swim at Fairfield University next season, was so close to earning a state championship but was edged by Kevin Tierney of Glastonbury by two-hundredths of a second (52.57 winning time) in the 100 back. McNab also came close to wearing a state crown, but Charlie Clark of Greenwich came out on top in the 100 free (46.57). McNab had beaten Clark the last five times they’ve raced, according to McNab. McNab and Twiss both won those respective events at FCIACs, and Gordon said he likes the duo’s chances of coming back strong at the Open but cautioned that anything can happen. Joining Twiss and McNab at the Open will be Lovro, who said he was excited to be competing at the Open. “The Yale pool is always high-energy so I’m looking forward to it,” he said. It’s been a great season yet again for Staples boys swimming. Gordon stepped up to take the reins of the program after serving as an assistant with the team a season ago, and the coach is hopeful his swimmers can have one last top swim in the season finale. “They all swam lifetime bests at the double-L meet and we had three divers qualify at states for the first time,” he said.